We first heard of this title during this year’s New York Comic Con. While walking around, we spotted the image above as a poster that we managed to snag. The art looked interesting, so we figured we’d take a look. 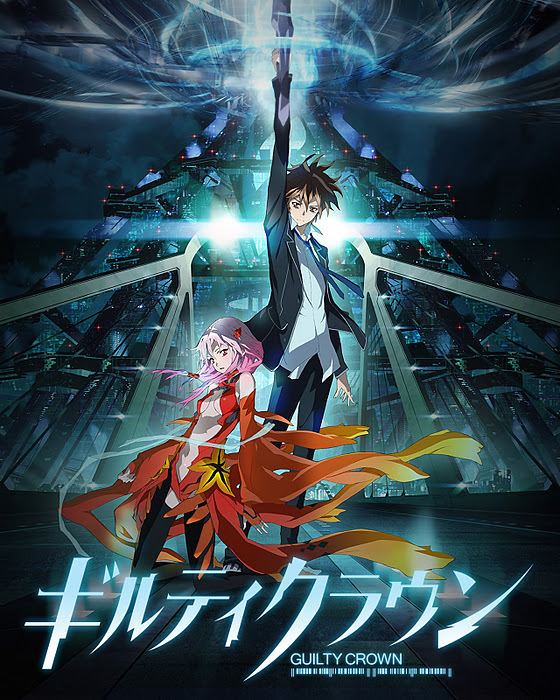 Guilty Crown is a 2011 Production IG title being aired in near peferct sync here in the states and in Japan. The story thus far (as of writing, up to episode six is available) is set in Japan of 2039. Ten years prior, an epidemic broke out called the “Apocolapsye Virus” throwing the entire country into chaos. An international corporation, known as GHQ stepped in and through martial law, restored order to Japan. The story revolves around Ouma Shu (we’re using Japanese name order, just fyi),a 17 year-old school boy who wants to live a peaceful life, but is socially awkward and resents his peers as he feels like they never think about him and his feeling when they open their mouths. He has a chance encounter with the lead female Yuzuriha Inori, a 16 year-old singer in a group called Egoist and secretly a member of a resitance called Funeral Parlor. The group fights to take Japan back from GHQ. 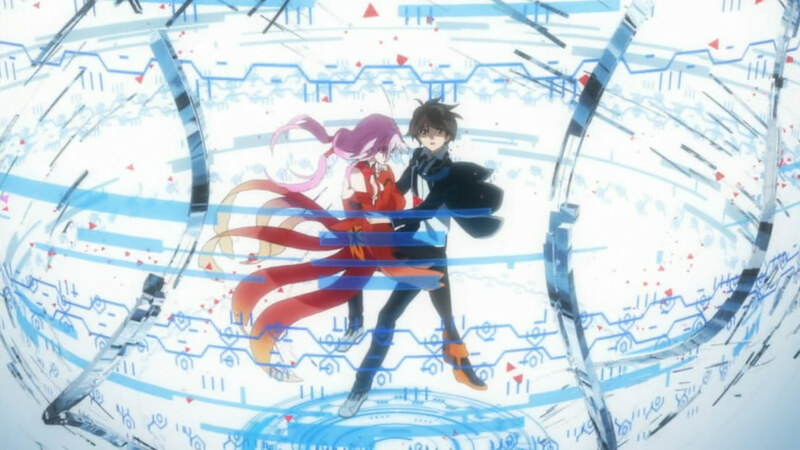 Shu is given a vial by Inori, containing the Void Genome. to keep safe and deliver to the third main character and head of Funeral Parlor, Tsutsugami Gai. In great story telling fashion, however, things don’t work out as planned and the vial breaks in Shu’s pocket, bestowing him with the Void Genome. The genome allows the host to forcibly pull an object specific to a person from their “Void”. Inori’s void holds a massive sword, easily six feet long. So far, the show seems very promising. The character development with Shu has already been put into motion and the stage is already being set for him to make some very tough decisions. Five episodes in and he’s already been stabbed in the back by someone that he thought he could trust. I’m not expecting him to go through the gut wrenching that say Al endured thoughout the entirity of Full Metal Alchemist, but he’s definitely going to be forced to sink or swim. I have less hope for rest of the cast, including Inori and Gai. Inori seems to a “Rei Ayanami” type of girl; very soft spoken, no real social skills, but very intelligent and cuts directly to the heart of the matter. Gai is a very precise and matter of fact leader. He’s smart, cunning, and willing to knock a few heads to get the job done. I don’t see his character going anywhere unless there is some kind of reveal to a tragic past and that he plays tough to cover for a scared emotional state. The character designs are pleasing and seemingly fresh. There’s a uniqueness to them that I haven’t seen since Bounen no Xam’d. The mechs (Yes, there are mecha in this show) are designed with some inkling of realism to them as they come across as more waif like. Think “Knightmare Frames” from Code Geass, but more spindlely. That description makes more sense once you see them. The animation is tight, but nothing less would be acceptable given that Production IG is behind it. The effects used for the void are great. We can’t tell exactly how they’re made, but we have an idea. All of the animation is super smooth, with none of it so far looking like it had been farmed out. The music is great as well. It seems that since Inori is part of a band, that a lot of the show’s actual music is used for her. The song in the beginning of the trailer below, is one of her songs from Egoist and it’s the first thing you hear in the first episode. There are a few other notable songs that Inori seems to sing that make it seem like there will be a big promotional push for the OST when that becomes available. 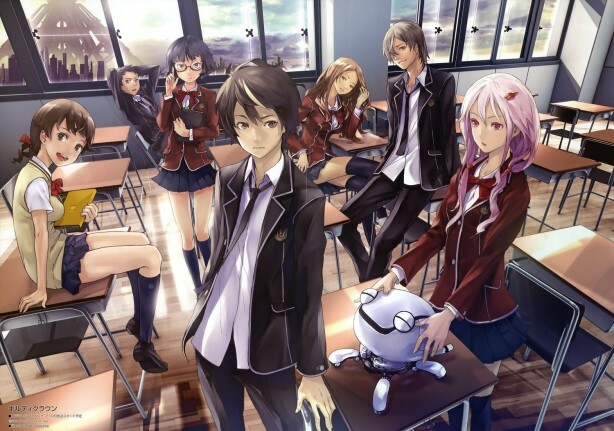 Guilty Crown is definitely one of the must watch animes for the Fall 2011 season. With almost non stop action and high drama that doesn’t get bogged down with the angsty, teen/emo nonsense that can accompany highschool drama, this show is on track to deliver an amazing ride. This could be the next Eureka Seven or Bounen no Xam’d people.